These metal sleigh runners easily fit on our Easy Entry or Show/Pleasure style carts. You simply remove the wheels and slip on the sleigh runners and away you go. 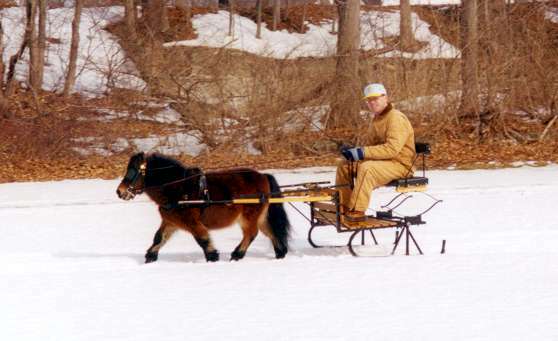 These photos show the sleigh runners attached to our Easy Entry style cart being pulled by a single, 30" miniature. 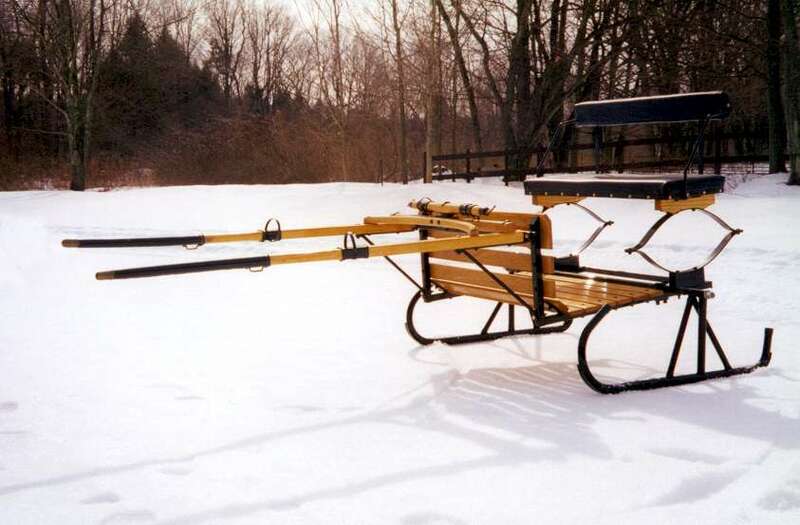 With the addition of a center pole, the cart/sleigh can be pulled by a team. 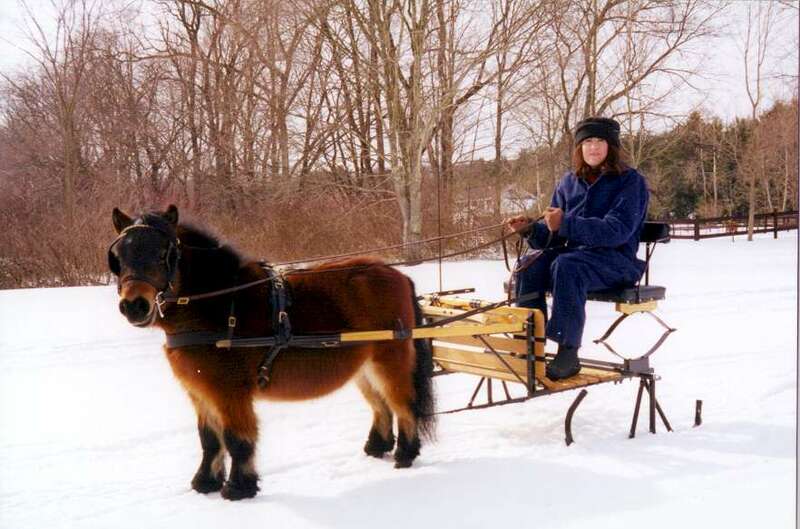 The mini sleigh runners (up to 38" horse) cost $205 and the small pony size (>38"-42" horse) is $225, plus $75 mini and $85 shipping per pair within the lower 48 states. My sleigh runners can usually fit most carts...If you didn't buy your cart from me, I would need the height and length of the animal, the axle diameter you are trying to fit, the length of the spindle that your wheel and now sleigh runner will sit on. 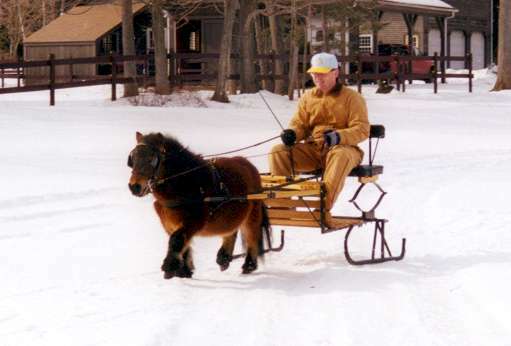 For my carts, the mini sleigh runner is approximately 34-35" long, made to fit a 3/4" bearing size and the sleeves are 3.25" long (fits on spindle). You can use a set or lock collar on the spindle to reduce the spindle size if necessary. This customer states: "The runners went on like a dream. Your cart builder knows his stuff......has runners canted just a bit so shouldn't slide...a real problem with "old" runners, especially on our hilly land. Also, longer so shouldn't dig in."